Astronaut Andreas Mogensen controlled this earthbound rover from the International Space Station, using the rover's force sensors to complete precise operations on a task board (left). Demonstrating one small step for rover operations, a European astronaut successfully maneuvered a machine on Earth in precision operations from his perch 248 miles (400 kilometers) high on the International Space Station. 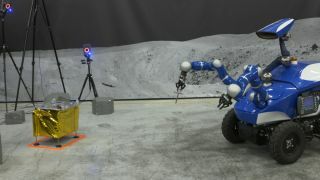 Sept. 7, the European Space Agency (ESA) astronaut Andreas Mogensen helped demonstrate the first "force feedback" using a rover controlled from space. With the help of a system that let him feel forces pressing against the rover's arm, Mogensen remotely inserted a small, round peg into a "task board" that offered just a fraction of a millimeter of clearance. Andreas Mogensen, aboard the International Space Station, is visible here controlling the Interact rover as it prepared to place a metal peg into a hole. "He had never operated the rover before, but its controls turned out to be very intuitive," Schiele said in the statement. "Andreas took 45 minutes to reach the task board and then insert the pin on his first attempt, and less than 10 minutes on his follow-up attempt, showing a very steep learning curve." Clever engineering allowed the astronaut to "feel" his way around the hole despite there being a 1-second delay between his movements and what was happening on the ground. The team — which included members from the European Space Research and Technology Centre (ESTEC) and graduate students from Delft University of Technology, both in the Netherlands — created software models to compensate for the lag. The signal from the space station has to pass through several obstacles before reaching ESTEC and the waiting rover. After leaving the station, the signal goes to satellites in geosynchronous orbit roughly 22,300 miles (36,000 km) high, beams to a ground station in New Mexico (via NASA's Johnson Space Center) and then travels to ESTEC via a transatlantic cable. By the time the signal gets back from the International Space Station, the round-trip is more than 89,000 miles (144,000 km), the equivalent of nearly halfway to the moon. Besides placing a peg in a hole, Mogensen also evaluated the stiffness of different springs on the joystick to figure out the appropriate sensitivity for the device. The experiment, called Interact, is intended to pioneer remote-control operations from space. As astronauts expand exploration across the solar system, someday this technology could be used for lunar bases or exploring Mars, ESA officials added.